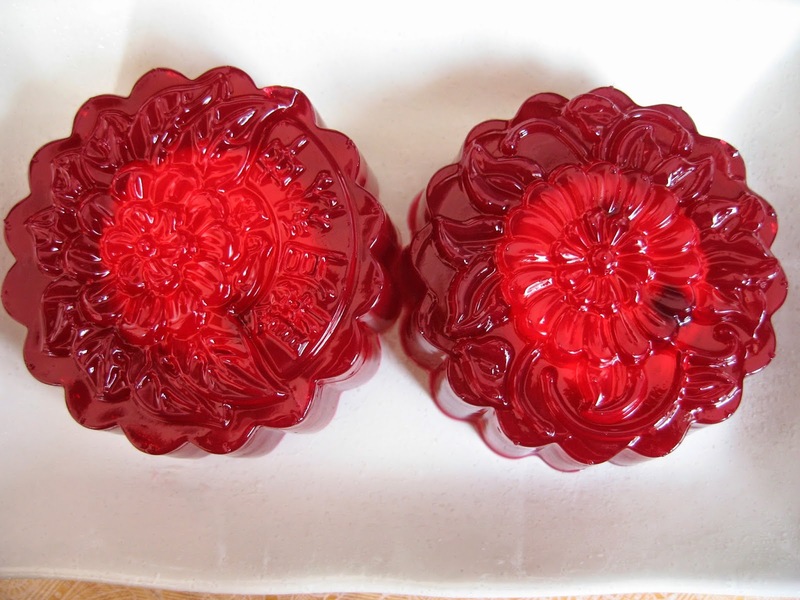 I love making jelly mooncakes. And it goes without saying that I love eating them as well! I treat them more as a jelly i.e. more as a dessert than as a traditional mooncake. 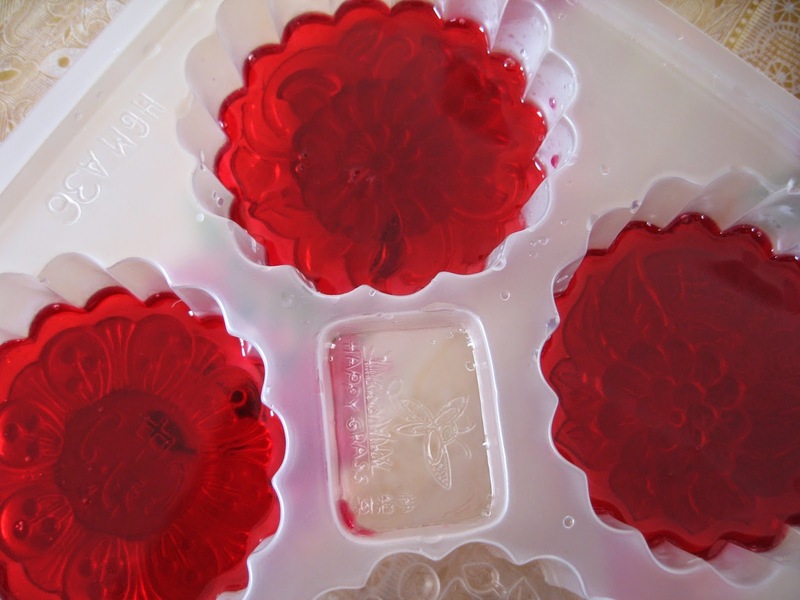 Which means I can make them anytime I feel like eating jellies. They are colourful and very refreshing, especially when they are well chilled before being served. 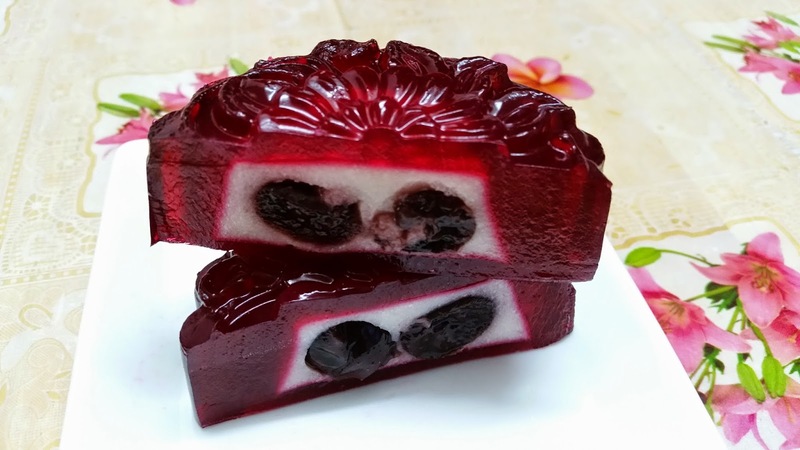 I always serve jelly mooncakes as desserts after a hearty Mid-Autumn dinner which my family celebrates without fail every year. We need to keep traditions and cultures alive, to pass on to the next generation even though these may be mere jellies. It's the symbolism that counts. A symbolism of sharing mooncakes, Chinese tea and pomelos with friends and family gathering together to admire the full moon and the children's brightly coloured lanterns! Just talking about it has already gotten me into the mood of looking forward and anticipating the Mid-Autumn festivities. 1. Bring the first 4 ingredients to a boil. Add in soften cream cheese and stir continuously with hand whisk. 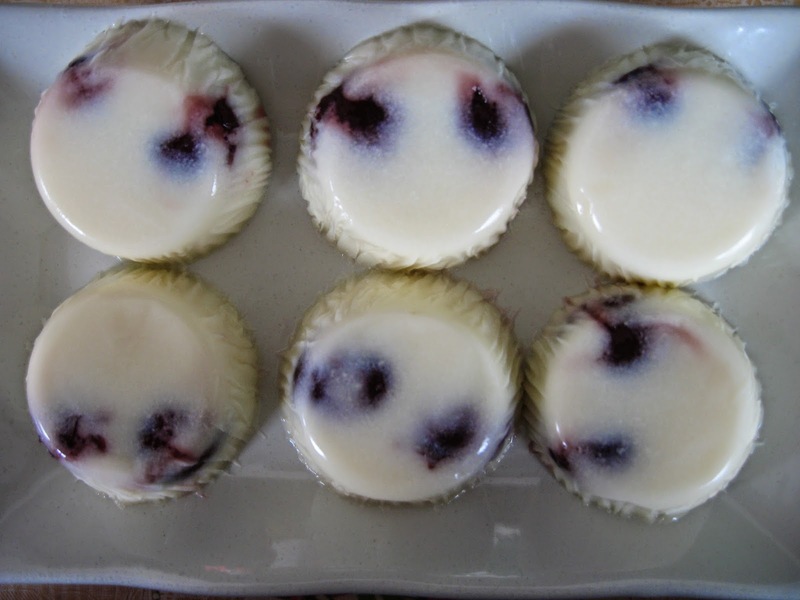 Turn off heat once mixture starts to bubble and pour into round tart moulds. 2. 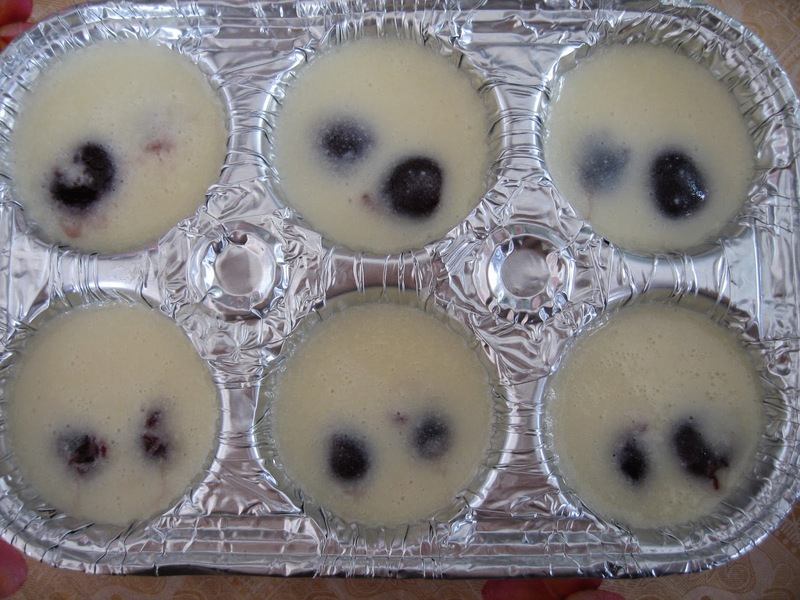 Add in 2 pitted cherries into each mould and allow to set completely before chilling in the refrigerator for another 30 minutes. 1. Bring the first three ingredients to a boil. 2. Add cherry syrup and colouring and bring to a quick boil again. 3. 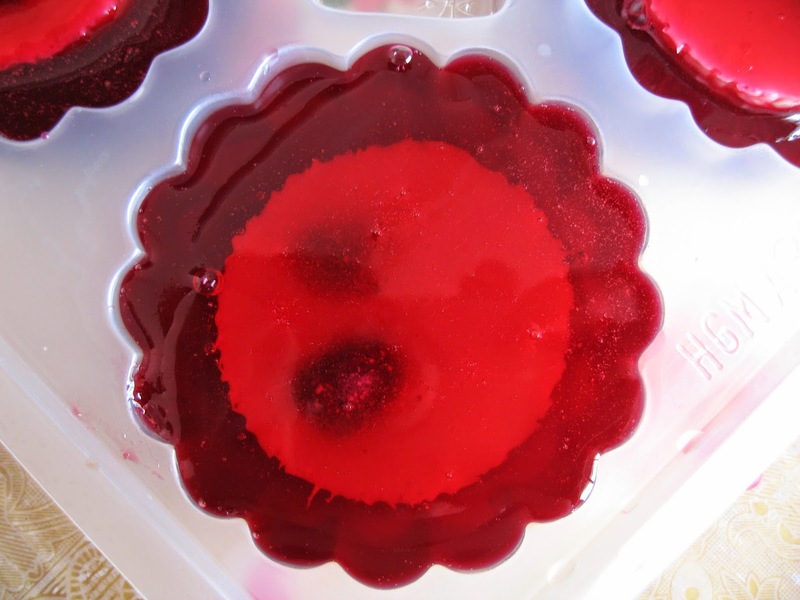 Pour in 1/2 cm of this syrup into a jelly mooncake mould and allow to cool until it is almost set. 4. 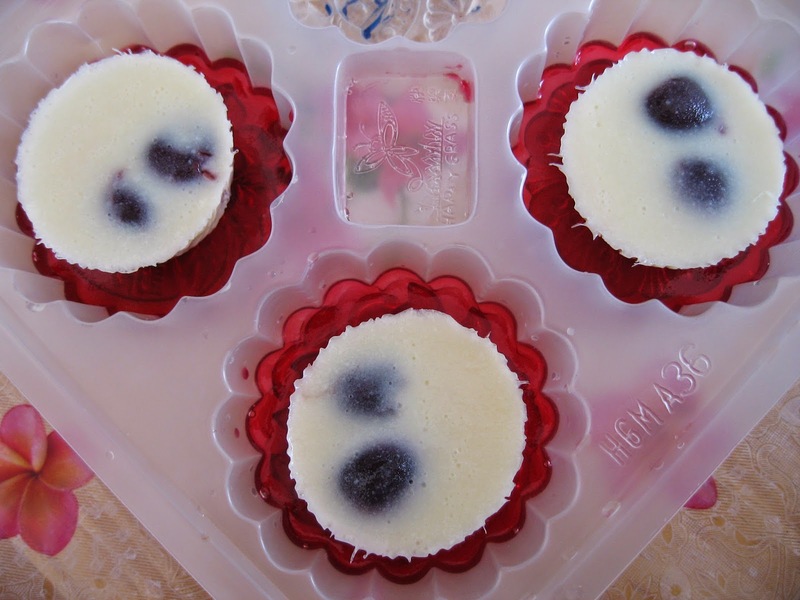 Place one piece of pre-prepared cheese filling into the centre of the jelly mooncake mould. 5. Fill up with cheery syrup skin mixture and allow to set completely. It takes about 20 minutes to set. 6. Chill in refrigerator for another 30 minutes. Your are certainly early in making mooncakes, haha. Your jelly mooncakes look gorgeous and must be yummy. Mooncake festival is one of my fav festivals..... your jelly mooncake looks really good. 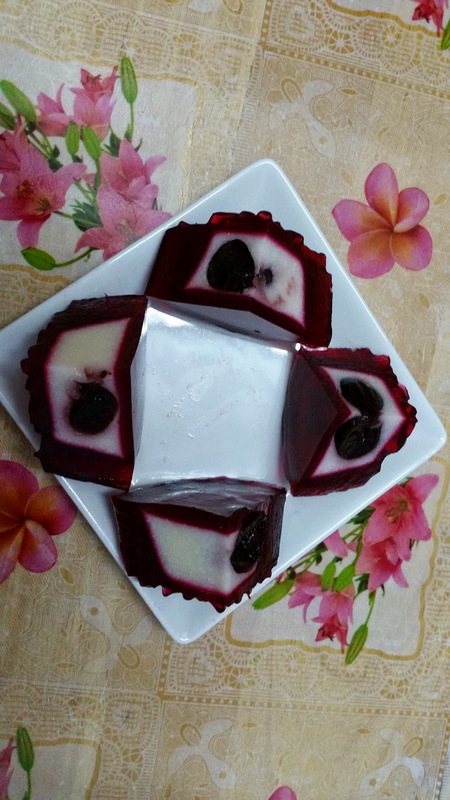 Like I said before, jelly mooncakes can be eaten as a dessert anytime and not just during the mooncake festival. Enjoy.